Isla de Ometepe in Nicaragua is formed out of two volcanoes: Volcan Concepcion and Volcan Maderas. It is the largest island located on a fresh water lake in the world – and it’s well worth a visit. Staying in San Juan del Sur or Granada? Your hostel should have plenty of info on bus times and prices. Check out the map below to start planning your route. 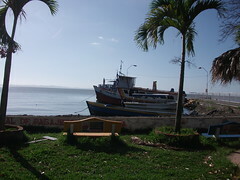 From Granada: Get a direct boat (Monday and Thursday) or get the local bus to Rivas (takes 1 hour), a taxi to the port (10 minutes) and a boat from there (1 hour) to Moyogalpa. From San Juan Del Sur : Get a bus to Rivas (40 minutes) and a boat from there (1 hour) to Moyogalpa. See more pictures of Ometepe and check out the freshwater springs. Need more advice on travelling through Nicaragua? Follow our top tips on staying safe in Central America.